Ivanka Trump’s Women Who Work is an incredibly and almost profoundly boring book. Mercifully, for those of us who have jobs to do, it’s also a pretty quick read. At 217 pages, it fits comfortably into the “empowered female boss” subgenre of business books, and contains a standard mix of stock phrases about “multidimensional” women, a press release for both Ivanka’s and the Trump brand, and a soft-focus biography (don’t expect anything about the White House here). 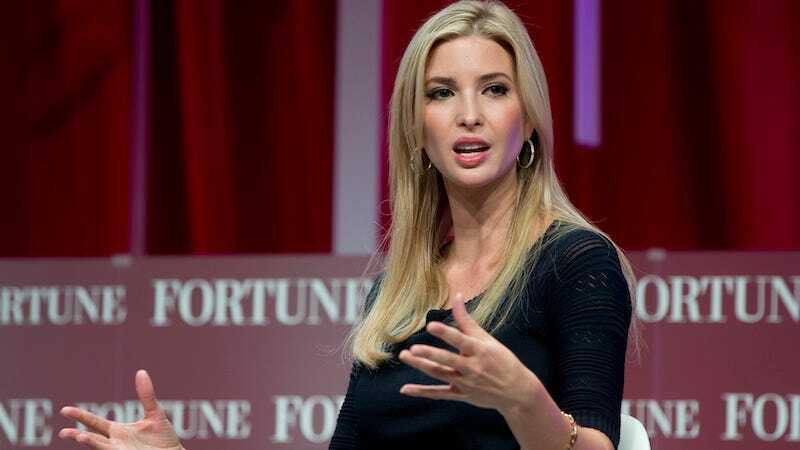 Women Who Work: Rewriting the Rules for Success is Ivanka’s “manual for architecting the life you want to live,” written with the intention of changing the “narrative” around working women. “Architecting your life,” is a phrase Trump uses repeatedly throughout the book. She is fond of this kind of MBA lingo and action words like “architecting,” “accelerate,” “disrupt,” and “unleash” punctuate the cliche advice she shares. She wants to “unleash the full power of women and girls,” “accelerate the pace of progress” for working women, and “disrupt the dialogue around women who work.” The language seems important to Trump, as though the language of action is proof of the success of her working life. The irony here is that Trump doesn’t appear to do much actual work in Women Who Work, even as she offers herself up as an example of how to be a “multidimensional” woman who works hard, loves her family, and looks feminine while she does it all. Part of the problem is that Trump is reluctant or perhaps unable to define “work.” Work and the women who do it are, in many respects, abstractions. Women Who Work defines working women as, well, every woman with a disposable income: stay-at-home moms, single women in the boardroom, mothers with full-time jobs, and entrepreneurs like herself. Work, too, is equally abstract: “Work takes many forms,” Trump writes. While the concept of work is hazy, Trump writes about working women with a more lucid picture, even if it’s clear that she can only envision a particular kind of working woman: the white-collar work of a boardroom. It’s the work of Ivanka Trump and her mother, and of the Sheryl Sandbergs and Anne-Marie Slaughters of the world, both of whom she cites at length. Because work is amorphous, Trump’s advice on how to be a working woman—and particularly a working mother—is both specific to her understanding of labor and also wildly broad. Trump believes that choice is a neutral exercise, rather than action underpinned by resources and financial safety nets: “You chose the kind of work you do, the character of the people who surround you, the type of organization to which you will or won’t devote yourself,” she writes. She advises women to be authentic in the workplace while refraining from oversharing, to negotiate salaries, and to use periods of unemployment to reflect on their goals. (She also recommends that you hire three recruiters to secure a new position.) Trump seems to honestly believe that success naturally follows the dogged pursuit of passion, and so she encourages women to find their passion and pursue it with gusto; to cultivate a culture of success; to effectively lean in. But she does so in phrases softer than even Sandberg’s iconically narrow advice. Trump believes that choice is a neutral exercise, rather than action underpinned by resources and financial safety nets. Early one morning during finals, the phone rang...It was Anna Wintour, the editor and chief of Vogue. Anna is someone I’ve always admired; we met when I’d done some modeling as a teenager. She’d heard that I was graduating soon. She knew I liked fashion. She wanted to offer me a job at Vogue. I personally love the word curious. I identify with it quite a bit because I am deeply curious, and that’s how I develop my interest in things that ultimately turn into passions for me. For one thing, you have to read, which can trigger lots of interest and ideas. I consume a tremendous amount of information: books, newspapers, trade publications, magazines (that start as pleasure reading but become work related as I’m always tearing out pages and sending them to my team). TED Talks and podcasts are another way I diversify my own information bias and expose myself to bite-sized, snackable bits of information on topics like, say, neuroscience—that I’m never going to read a whole book on but are mind expanding and may trigger an idea. There is also a whole page devoted to Trump’s Moleskine notebook, where she “jots down miscellaneous things I want to accomplish,” a page on her version of Ryder Carroll’s Bullet Journal, and a paragraph devoted to her digital color-coded calendar. In fairness to Ivanka, that narrative of empowerment isn’t hers alone. It’s common parlance in many publications targeted to women with disposable incomes: it’s at Refinery29, where women are empowered doing anything the “discourse” says they shouldn’t (wearing a bikini, taking a selfie, etc); it’s in Sheryl Sandberg’s Lean In, where systemic discrimination is toppled by board room disruption; it’s in Sophia Amoruso’s #GIRLBOSS, where capitalism is wielded as a fundamental feminist expression. The narrative, the lingo of empowerment tells us, is what’s making women’s lives hard. Discourse is the enemy, they argue, but not the structures that produce discourse. Ivanka Trump might be complicit, and she might even be a monster. But if she is, then the empty lingo of women’s empowerment is her Doctor Frankenstein.